If you know someone that is turning the big 5-0 soon, these 50 Plates will be a hit at their Birthday party! Not a single family member or friend will have to ask them how old they are once they see these 50 Plates. With such bright tableware, you can keep your party decorations simple. These white paper plates are 9" in diameter, and have colorful printed 50's all over the plate. 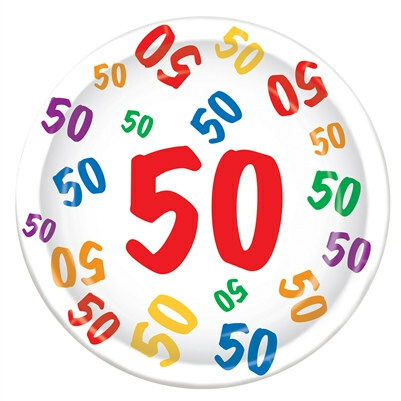 White Paper Plate Randomly Printed Assorted Color "50"
Quality and delivery time exactly as expected.